My Third Trimester — Stevie Storck Design Co.
Um, didn't I just write my second trimester update post? And here I am, 9 months pregnant and Anthony and I are just a couple of weeks (or days!) away from meeting our daughter for the first time. Warning, this is a majorly photo heavy post for the same reason I have yet to order prints from our maternity session with Savannah Smith Photography -- I just love them all too much to pick favorites! In fact, I went back and added more photos to both my first and second trimester post because I'm feeling so sentimental about the fact that I'm nearing the end of this pregnancy. I turned the corner into the third trimester just before our 27th birthdays. Anthony and I were born the same year and exactly a week apart. Me at the end of March, him at the beginning of April. So if our little girl is born in late May like she's expected to, we'll all three have back to back birthday months! Also right around that time, we celebrated our baby shower at a local brewery. It was a low key, co-ed party decorated beautifully by my best friend, Jess. My college girlfriends travelled from across the country that weekend to celebrate with us and we had so much fun with our family and friends, we didn't want the shower to end! It was really the perfect day. 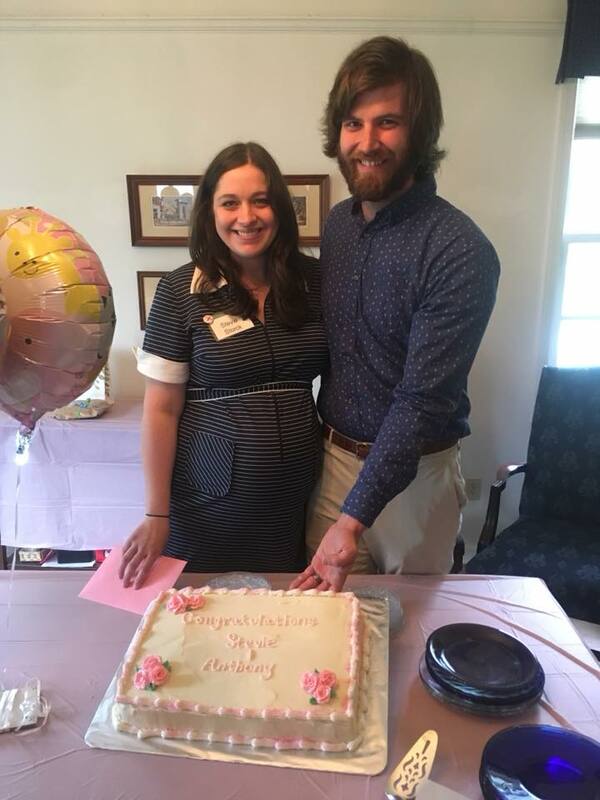 A few weeks later, my friends from church choir threw us a surprise shower disguised as an "important extra rehearsal" which was so unexpected and incredibly sweet of them! Over the past year and a half, our church community has become like another family to us and we are so happy to get to share that with our daughter as she grows up! I think my second trimester energy stuck around until about 31 weeks. Since then, it's been a bit of a rollercoaster! For a long while, I was just feeling so exhausted all the time. I've also realized that my body is very clued into the weather! I've had Braxton Hicks fairly consistently since the second trimester but in the last 8 weeks I've had four bouts with strong pre-labor symptoms, which after looking back have all coincided with stormy weather. My midwife mentioned that sudden changes in barometric pressure can kickstart contractions or labor in some women. The first time it happened, they had me in for observation just to be certain it wasn't preterm labor. Since then, I've done my best to ignore the contractions knowing that when it's real labor, I'll know. But it's definitely a mind game here as I'm nearing full term! I have felt more energetic lately, and I think that might be because the baby dropped earlier last week. I have a little more room to breathe, but also, now that she's lower that makes for another kind of discomfort so I've been taking lots of baths to relax my achy body! Overall, I can't complain. Pregnancy definitely has it's discomforts and challenges, but I'm lucky that both the baby and I are healthy and everything has been going smoothly and normally up to this point. Also speaking of changes, we just have one monthly photo left to take! We'll take my last bump photo on our Instax Mini at 40 weeks, unless she decides to come sooner than that -- then the series would end with a picture of me holding her on the outside. In case you missed it, the nursery is now complete! We decided to join in with the One Room Challenge to get our butts in gear and finish our daughter's room before she arrives. I shared weekly posts of our progress over the last 6 weeks, ending with the big reveal this past Thursday! Working together on our first baby's nursery has been such a special experience for Anthony and I. I think it's safe to say it's now our favorite room in the house and we are so looking forward to spending time as a family in here. You can catch up on the renovation and see more photos of the finished space right here. About a month ago, I started thinking about what to pack in our hospital bag and it quickly became my number one obsession in life. Seriously, I approached this simple task with the effort and enthusiasm that most people reserve for their master's thesis. In trying to be a minimalist, but also not wanting to overlook any important items I set up the ultimate opportunity to overthink every last detail. I'm pretty sure I drove Anthony and all my mom friends crazy with all the questions and links I sent them. I saved all the things I got on this Pinterest board. Maybe after she's born, I'll put together a post of what I packed and if there's anything I wish I would have brought or things I could have left at home. Last week I wrapped up a lot of things on my to-do list, from finishing the nursery to sending off my last bit of client work before maternity leave. Those were both a big relief to check off, and now I'm feeling about as calm and ready as I can be about welcoming our daughter into the world. My pregnancy feels like it has gone so fast in some ways, and in other ways I feel like I've been waiting a lifetime to meet this little soul. Excited doesn't begin to cover how I feel about becoming a mother in just a couple short weeks. Anthony and I are both feeling so lucky and grateful. We're trying to soak up these last moments as a family of two- well three, counting Chloe! But man, oh man, we are looking forward to this next chapter of becoming parents and getting to know our little girl.